Imagine the scene: you are walking down a dimly lit street by yourself, thoughts of a long, hard day at work penetrating your unwinding hour. A scowl shapes your face as thoughts of the day enter your mind: the conman that sauntered into the office to persuade you to donate to an unknown cause; the prattling employee that cornered you into giving him time off work; your family pestering you about when you intend to visit them knowing, fully well, that you’re too busy. You walk faster, the winter weather engulfing your fingertips, but you don’t notice the pain: you’re so lost in your own thoughts. The streetlights are glazed with frost, making the shadows seem larger and more foreboding – yet there’s nothing visibly obstructing your path on the street. Finally, you’re home. On the doorstep you turn the key. On Friday 18th December, Strathclyde University’s ReAct Theatre Group are performing Dickens’ renowned play and novel, A Christmas Carol – directed by our own Jeff Portier and Craig Edmond. The performance will follow the original dialogue from Dickens’ novel but with a slight twist of 1980s grunge. Think Baz Luhrmann’s Romeo and Juliet but with teased hair, neon make-up and turtle-neck sweaters. Pure magic. Whilst treating the audience to an 80s vibe, ReAct are determined to illustrate the thought-provoking morals of the story in a sincere interpretation which will leave you immersed in the Christmas Spirit. 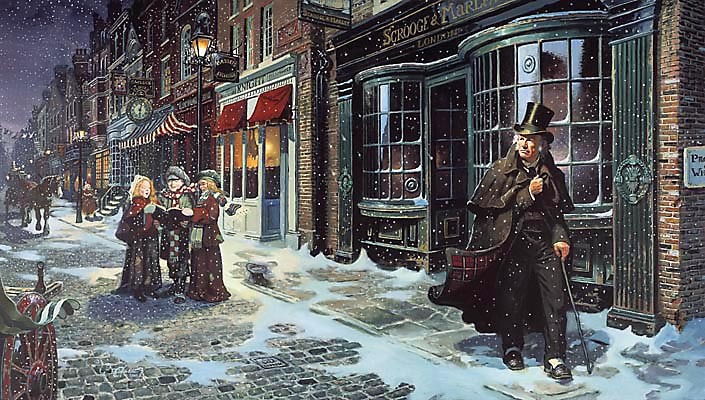 So, don’t be a Scrooge this December! Come and see ReAct’s adaptation of A Christmas Carol in Vertigo on the 18th.